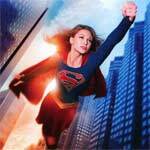 Supergirl: Season 3 is a solid year for the Girl of Steel and features a fine performance from star Melissa Benoist who absolutely owns the role. The writing, however, still is weak though some of the actual storylines were decent and had some cool villains. Supergirl: The Complete Third Season Flies onto Blu-ray & DVD on 9/18/18! Warner Brothers Home Entertainment has announced the date and released artwork for the third season of Supergirl starring Melissa Benoist. Click on the link below or image to the left to check out the features and artwork. “Supergirl”: The Complete First Season has its issues, especially early on, yet as the season wore on, the writing got better, particularly the dialogue. But from beginning to end, the casting was pitch perfect starting with Melissa Benoist who is both beautiful and charismatic to pull off a character like Supergirl/Kara.